The Extractive Industries Transparency Initiative (EITI) is apparently the only renowned extractive industries transparency standard in the world today. The initiative, in practical terms, involving reconciliation of payments (taxes, fees, royalties) that governments receive from oil, gas or mining companies in a particular fiscal year, has been globally lauded. EITI is ostensibly geared to promote material information disclosure on the legal payments that extractive companies contribute to governments’ revenues. Civil society representatives, formally invited to observe the process that involves reconciliation of companies’ payments and governments’ receipts resulting from extractive industries operations, legitimise the initiative, which is generally voluntary. Perhaps some analysts viewing the EITI process as quasi legal could be close to reality, bearing in mind that a gentleman’s agreement – a memorandum of understanding or terms of reference – is set in place to steer cooperation principles. Such gentleman’s agreements bind companies, civil society and governments to work together in a Multi-Stakeholders Group (MSG) charged with overseeing EITI reconciliation and reporting. But experience has shown that EITI stakeholders’ domain is limitless, expanding to include bilateral and multilateral agencies who directly or indirectly support the initiative technically and financially. MSG, amongst others, is obligated to annually publish reconciliation reports, possibly followed by a validation, and submit the same to the EITI international secretariat, which again tables the same to the EITI International Board for review and endorsement. EITI country reports reveal the status of extractive companies payments vs. governments’ revenue received from extractive industries operations in a particular fiscal year. Assuming existence of a vibrant and civic competent public in resource-rich countries implementing the initiative, EITI reports would be regarded as ‘stock in business’. Tanzania is a resource-rich country endowed with plenty of minerals and natural gas deposits. The country possesses enormous proven quantities of tanzanite (12.6 tons), gold (2,222 tons), diamond (50.9 million carats), copper (13.65 million tons), nickel (40 million tons), uranium (35.9 million pounds), coal (1.5 billion tons), iron ore, and over 45 trillion cubic feet of natural gas. A number of large-scale mining, oil and natural gas companies are licensed, and therefore currently carrying out mostly upstream activities. Over 30 large-scale extractive companies, including the giants Barrick Gold, Anglo Gold, Resolute Mining, Mantra Resources, Petrobras, Ophir, British Gas (BG), and Statoil, to mention only a few high profile extractive companies, are painstakingly operating in Tanzania. Tanzania acceded to EITI in February 2009 following fulfilment of EITI initial requirements. In a public declaration in mid November 2008, the Government had stated Tanzania’s commitment to implementing EITI. Tanzania had, by 27th January 2009, accomplished the pre-EITI launch groundwork, including formation of MSG, drafting of terms of reference and crafted a full-costed work plan. EITI International Board (1) announced admittance of Tanzania to start implementation of EITI on 16th February 2009 in Doha, Qatar. Previously, the public had been apparently discontented over prevalent opacity, mediocrity and impunity, prompting perception of corruption as senior government officials regulated mineral and gas resources in the country. Even today, the public believes corruption and rent-seeking had significantly influenced the Government secretly entering into Mining Development Agreements (MDAs) and Gas Production Sharing Agreements (PSAs) with extractive companies. The EITI International Board has on the 12th of December 2012 declared Tanzania EITI compliant. However, close examination of the initiative implementation shows a corrosive and callus situation. Since EITI implementation started, material resources information and knowledge across the Government, companies, civil society and media stakeholders have continued to remain at the bottom. A reflection on the EITI inception workshop organised by the Government in December 2008 reveals that everything ended helplessly without tangible conclusions. Only the second workshop, held in January 2009, ended up with relatively meaningful outcomes (2) in the context of EITI inception definition. The workshop was concluded with the formation of MSG, a crafted costed work-plan, and draft terms of reference tentatively agreed by stakeholders. However, even with the second workshop promising outcomes, records show that Government-invited civil society representatives were poorly informed, disorganised and disoriented. This implies that the process of EITI in Tanzania started with weak (3) civil society participation. Only few civil society representatives acting on sheer activism, gate-crashed into the second workshop. Noteworthy is the fact that gate-crashers won the trust of formally invited fellows and ended up being nominated to represent civil society constituency in the MSG – this signifies an unpleasant beginning of EITI implementing in Tanzania. Undeniably, Tanzania seems to have successfully implemented EITI – MSG has so far published two reports – the 2008/2009 and 2009/2010 fiscal years, thus earning the recognition of being EITI compliant. However, there could be a number of issues stalling behind the scene – a weak civil society, Government caring little or nothing about civil society significance in EITI process, an ambivalent Government representation in the MSG, opportunistic oriented profiteering mining companies, but above all, a largely corrupt civil service little concerned about transparency and accountability ethics. MSG borrows all technical staff, but two from the Government to staff the EITI Secretariat in the country. It is no wonder that His Excellency, Jakaya Kikwete, President of the United Republic of Tanzania spoke loudly and boldly at the 5th EITI international conference in Paris 2011, the time Tanzania had just published the first report, but mentioned nothing about Tanzania EITI compliant achievement in his New Year 2013 Speech to the Nation. Surely like others elsewhere, Tanzania EITI reports are unique. Open and obscured details characterise the reports (4). Reading Tanzania’s first EITI report highlights a number of questions starkly shining above numerical discrepancy. No windfall tax charged despite goldmine companies having confirmed super profits. No capital gains tax charged despite reported mergers and acquisitions during the year. Why did the Government negotiate MDAs with no considerations of such vital taxes? Neither MSG nor EITI was expected to provide credible answers. Again, corporate tax yield from extractive industries, as captured in the report, is as meagre as 1.04 percent of entire extractive industries yield. Mining workers’ Pay As You Earn (PAYE) tax yield feeding into the Government coffers during the 2008/9 fiscal year was 48.74 percent of all extractive industries revenue. Workers paid the tune of US$ 35,151,382 to the Government while the extractive companies paid only US$ 1,097,111 as corporate tax from mining and gas operations. Likewise, the first Tanzania EITI report shows discrepancy – Government failing to account for US$36million, of which US$17million were royalties received by Ministry of Energy and Minerals (MEM). Where did the money go? The Controller and Auditor General (CAG) tried for over one year but failed to get a plausible answer from MEM until the World Bank forced it out of it. Unfortunately, the World Bank exclusive answer is not applicable to quenching Tanzanians thirsty, including the Government’s black and white statement regarding rationale for MEM, instead of Tanzania Revenue Authority (TRA), to manage royalties – the core extractive industries yield constituting significant public revenue. The second report is more or less the same as its predecessor. No major taxes are seen to be paid apart from mining workers’ PAYE and other statutory contributions. Despite showing the extractive industries revenue yield triple, from 135,684,607,000 Tanzanian shillings during 2008/9 to 419,552,271,000 Tanzanian shillings during 2009/10, the contribution of key taxes from core extractive industries remains very low. Ballooning of revenue actually results from 3 Portland cement and 6 gas industries’ taxes, not included in the first report. Again, the Value Added Tax (VAT) not included in the first report has a significant effect on extractive industries total revenue documented in the second report. VAT effect in the report is plausibly understood, cement and gas exploration companies are known for their massive local procurements that finally attract VAT, accounting 28.38 percent, against 6.6 percent corporate tax contribution from entire large scale mining, oil and gas operations. A significant discrepancy involving TRA and Geita Goldmine, amounting to 35bn Tanzanian shillings, is stated to have been resolved following TRA, not MSG, instituting an internal audit. An active MSG would instead have instructed an independent audit to clear mistrust or doubt. As way of conclusion, the notion that being EITI compliant Tanzania governs her mining, oil and gas resources transparently and accountably with ramification to prudent and efficient management of the country’s economy is, perhaps, a smoke screen. A lot more is required for Tanzania to be really seen as compliant with EITI standards. 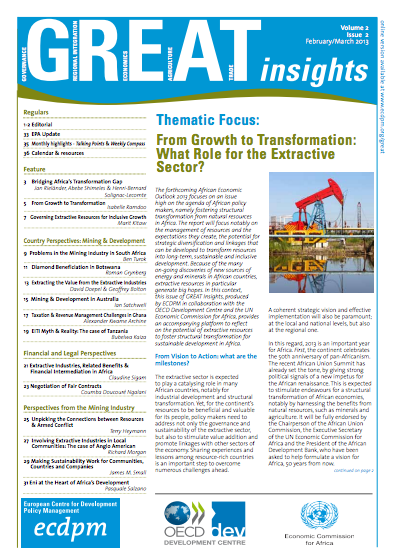 Rigorous reforms should be instituted to change the mindset of Government staff and political bureaucrats, governance structures and systems, relevant policy and laws, but above all, to build a competent civil society that will demand transparency and accountability to ensure that information on mining, oil and gas material is disclosed and publicly available for citizens to scrutinize the revenue the Government receives from extractive companies. Indeed, it is worth noting that MSG has recently finalised a review and submitted draft EITI legislation to the Government. 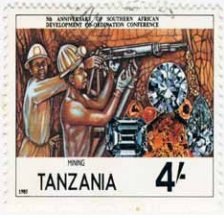 Nevertheless, such critical issues as overseeing supremacy of the law of the land over MDAs and PSAs, expanding and enforcing tax base to cover windfall and capital gains taxes, monitor mergers and acquisitions to enforce appropriate taxes, instituting strategic management of extractive revenues, including charging the Tanzania Revenue Authority instead of the Ministry of Energy and Minerals to collect royalties, amongst other issues discussed above, rely entirely on the confidence of the Tanzanian Government to enforce legislations rather than having the statutes in place. Only will then Tanzania become truly EITI compliant. Bubelwa Kaiza is Publish What You Pay (PWYP) National Coordinator in Tanzania and Tanzania EITI Multi-Stakeholder Group (MSG) Member. 1. During the 7th International Board meeting.